Jump City’s Blue Slip and Slide Inflatable Water Slide when kids want to enjoy a classic! Jump City’s Blue Slip and Slide Inflatable Water Slide! 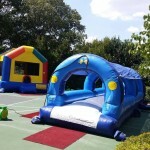 It’s a great item to have for party slide when the kids want to beat the blistering Texas heat!. It is ready for your children’s Party, or event. Rent one for your party today! Call now for your Dallas, Plano, Frisco, and all areas in between – we deliver on time every time!